Anyone who knows Laurie knows how big of a personality she is. Crazy, colorful, and fun are just a few words I would use to describe her. Problem is, her brand in no way reflected that personality. Additionally, with the launch of new programming coming up (Paragon Performance Training), it was vital to nail down a solid brand to expand upon. Working with Laurie has been some of the most fun I’ve had! We successfully overhauled her website to be reflective of her personality, and created a new logo to use not only on the website, but on apparel and other gear as well. Piggy-backing off the new website, we were also able to build a new website and logo for Paragon Performance Training, creating a seamless user experience between the 2 brands. Laurie had a website up and running already, but it was lacking visual-appeal. Laurie has a very outgoing personality, and her coaching style is reflective of that. 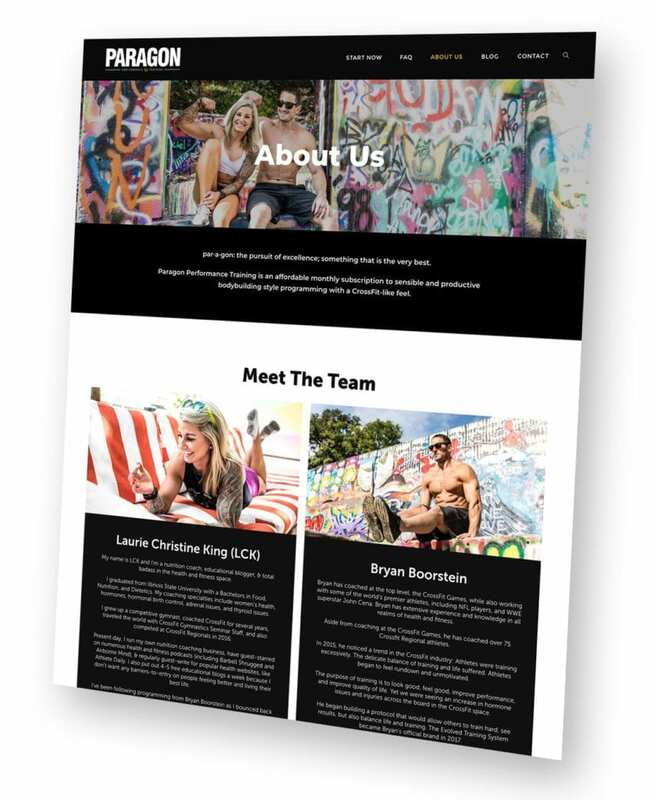 To successfully portray her style, we built a website full of color and flash, without being too distracting. The website now not only reflects Laurie’s personality, but is setup to sell her ebook and support a large blog of quality articles, easily readable across any device. Similar to the website, the logo for Laurie’s personal brand needed an update. We worked together to design a logo that is simple yet fun, and versatile enough to use in a variety of ways. The unique crown we used has been used on apparel, and is our way of connecting the LCK brand with the related online programming, Paragon Performance Training (more on that below). Laurie Christine King launched Paragon Performance Training alongside Bryan Boorstein. 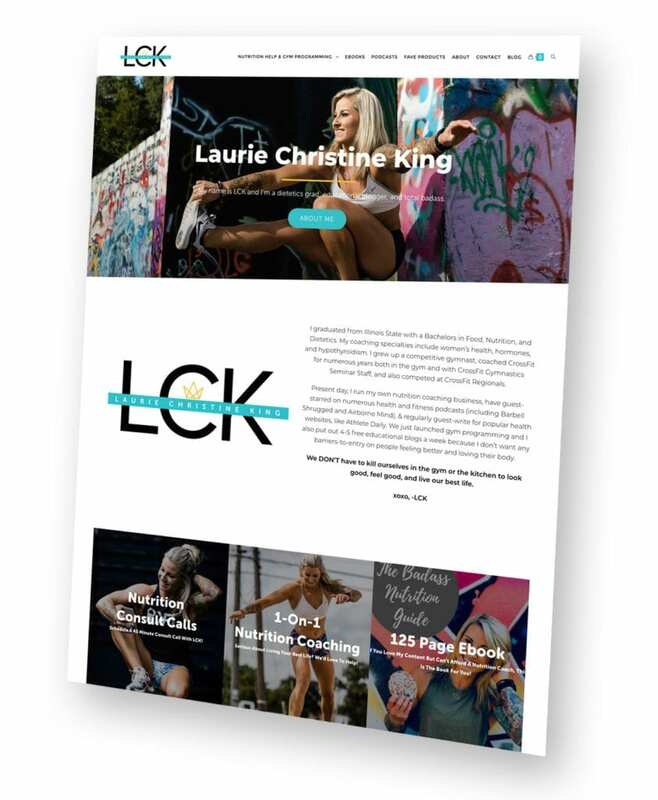 When designing the website for launch, we wanted to make it clear that it is part of the LCK brand, while still being identifiable as its own entity. The overall aesthetic is simple and clean, but a similar color scheme was used to tie it back into lauriechristineking.com. The Paragon Performance Training logo was designed to be very similar to the Laurie Christine King logo. While we wanted to make sure the logo could stand on its own, we chose to use the same color scheme and utilize the crown symbol from the LCK logo to tie it all together. We went with a thicker font for this one, and used the light blue as a secondary color in order to make sure this logo would not be overly feminine. Where the LCK brand places a major focus on the female audience Paragon Performance Training focuses on men and women, so we wanted to make sure the logo reflected that.